For some unforeseen reason, Barranquilla — the city where my mom lives in Colombia — has become my base of sorts. I didn’t intend it to, it just happened. This was one of the first stops when I started my nomadic journey. Since then, I’ve come back to see my family at least once a year; one of the luxuries that my freedom allows me. However, for one reason or another, I’ve always ended up missing the carnival celebrations, a colorful feast that has been declared by the UNESCO as one of the Masterpieces of the Oral and Intangible Heritage of Humanity. Which translates to those who live it, are the ones who enjoy it best. And what better way to live it than to actually participate in one of the parades? Plus, I’d cross item number 42 off my bucket list. It all worked out beautifully. After a couple of calls (and paying $150,000 COP), I was set to shake it with Disfrázate como quieras, one of a couple hundred comparsas (the different groups that dance together) at La Batalla de Flores, the main parade in Barranquilla’s carnival. Some of these groups practice their choreographies for many weeks ahead of carnival. And most of them dress in the traditional costumes, which are the trademark of Barranquilla’s particular folklore. It’s not so with Disfrázate Como Quieras. As their name implies (it means Dress Up as You Want), members are encouraged to dress up in whatever strikes their most extravagant fancies. And the same goes for the dancing. In fact, they warn you in advance that if your costume is not up to their standards you won’t be allowed to go with them. That’s when I knew I had to get creative, so I raided my little niece’s closet and found some spiky headdress, I borrowed my sister’s fake rainbow eyelashes and bought a mask; I wore matching comfy clothes and voilà! 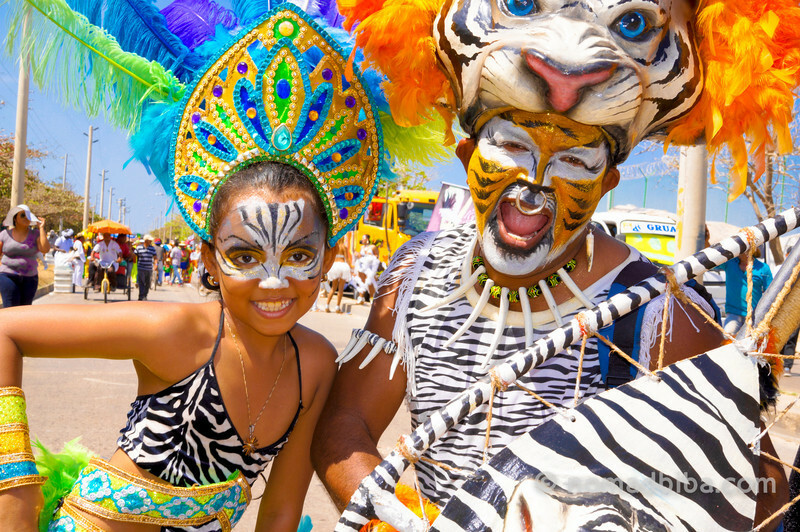 La Batalla de Flores takes place on the Saturday before Ash Wednesday and it’s one of the most popular events of carnival in Barranquilla, attracting thousands and thousands of people. A couple of hours before the parade begins, the groups gather at their assigned posts and small warm-up parties start to form. There’s music, dancing and refreshing drinks; all to make up for the scorching heat and the lack of shade, and to get people in the carnival spirit, of course. The waiting time is also perfect for walking around to check out the costumes and take photos; the place is packed with people happy to strike a pose for my camera, most seem to be more at ease posing for someone who is also in disguise and I get lots of smiles. Also, it’s more comfortable for myself to shoot behind my mask; as I walk around, I notice I’m not the only one. By the time I’m done taking photos, I’m drenched in sweat and on the verge of quitting this place, it’s that hot! But the parade starts to move slowly forward; and, frankly, the concoction of rhum and coconut water that’s being served at the comparsa is doing it’s job and I’m feeling fresher and lighter. The dancing and music help, too! Dancing in La Batalla de Flores was one of the highlights of carnival 2013 for me; it was fun and liberating to be part of this free spirited crowd and I would definitely repeat the experience if I’m ever back in Barranquilla for carnival! If you’d like to see the rest of my photos from carnival, check out my gallery. Have you taken part in a parade before? How did you like it? Would you do it again? Let me know in the comments below! Bianca, I’ve never taken part in a carnival before but this makes me want to put on a pair of wings & channel my inner Michael Flatley of Riverdance fame. LOL Dale, that’d be quite a sight, I’d imagine :) If you’re in the area you should definitely try to make it for carnival next year. Just try to plan a little bit ahead because it’s THE only time this city is booked solid. 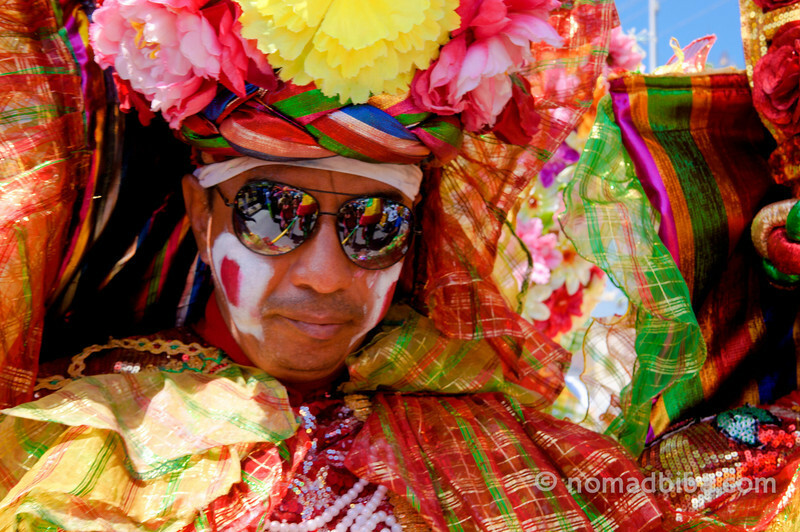 Wonderful photos–you’ve really transmitted the color and spirit of Carnival! What a great selection of shots. Sticking around for the carnival looks like it paid off in spades. Any headache after it all – what with hot sun and a little alcohol. You look gorgeous in your costume. Thanks, Leigh! Carnival was really, really fun; but now I’m ready to get out of the city and go play in nature for a while! Wow, this carnival sounds amazing. Not living in London any more, I really miss Notting Hill Carnival. Especially the rum punch and jelly coconut. Which makes Barranquilla sound like my kind of carnaval, what with the “rhum and coconut water”. I loved the video of the Batalla de Flores, especially when you added that this crazy and colorful parade continued for the next 8 kilometers! Thanks so much Cassandra! I’m glad you liked it :) I realized that I couldn’t give an accurate idea of what carnival is like in Barranquilla just by showing photos, the sounds of carnival are just as important. Wow I would LOVE to experience this one day! It looks so vibrant and colourful. Definitely adding this to my bucket list! Me gusta mucho el video. Gracias Bianca por compartir esta redacción sobre el carnaval de mi ciudad Barranquilla.